It is important to understand that there is an outstanding chance that you will recover from your low back pain in the near future. Research studies have shown that 74 % of those that suffer from back pain return to work within 4 weeks and > 90 % in 3 months or less. Some health care providers feel low back pain is like catching a cold – you experience it and in time it goes away. Closer inspection reveals five vertebrae (bones) stacked on top of each other with a fluid – filled disc in between each vertebrae. The lumbar spine is like a hollow, C-shaped curve (called the lumbar lordosis) which is arranged to balance tremendous forces. The curve or lumbar lordosis allows the spine to be 15 times stronger than if it were straight. Within the “hollow” of the spine is the spinal cord. The spinal cord is made up of nerves that, very simply put, wire your brain to your muscles and tell them when to contract. These nerves also are responsible for the sensation of touch and pain among other things. They exit out of holes called intervertebral (meaning in between the vertebrae) foramen and are called nerve roots. There are over 140 muscles that work together to move and stabilize the spine. Many of these muscles are located around the lumbar spine. There are the abdominal muscles, the erector muscles, the hip muscles, and lateral stabilizing muscles. The abdominal muscles consist of the rectus abdominus, the internal and external obliques, and the transverse abdominus. They provide frontal support, help maintain good posture, hold the abdominal organs in the correct location, and act together as your body’s own natural “back belt.” The erector spinae muscles run up and down your back to help you maintain erect posture and they assist in recovering from the forward bent position. Even deeper is a layer of muscles that assist in rotational movements and side bending. The hip muscles, most notably the gluteus maximus, hamstrings, and psoas (pronounced soas) move the pelvis and thighs. The gluteus maximus and hamstrings are your major lifting muscles. In fact, when you bend down to touch your toes, about 67% of the bending comes from your hips which is in turn controled by the gluteus maximus and hamstrings muscles. The psoas muscles help lift your thigh and stabilizes the spine. 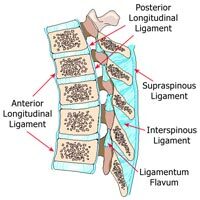 The lateral stabilizers – the quadratus lumborum and the latissamus dorsi both insert into the spinous and transverse processes via the thoracolumbar fascia. They also stabilize and move the spine. Any one or combination of structures can affect the curve or lumbar lordosis. Acute low back pain is defined as activity intolerance due to lower back or back-related leg symptoms of less than 3 months’ duration. Chronic low back pain, therefore, is defined as pain/problems lasting greater than 3 months. Regardless of the cause or duration of mechanical low back pain, the result is likely to be damaged soft tissue(s) which can stimulate nerves and produce pain. It is important to understand that it is next to impossible to determine exactly which tissue(s) are the cause of the low back pain. Someone like yourself may be experiencing pain and quite frankly, the cause is unknown. It could be muscle(s), ligament(s), disc(s), tendon(s), joint(s), and/or other connective tissue. They all can produce similar symptoms which commonly present as pain on one side of the back or across the back. It may radiate into the buttock or into the thigh. Quite often it will be accompanied by painful cramping of the muscles called a muscle spasm. Furthermore, medical research has shown that x-rays are of little help in determining the cause of low back pain except in rare cases such as severe trauma. Magnetic resonance imaging (MRI) is also ineffective at determining the cause of low back pain. For example 2 out of 3 people have positive findings for disc abnormalities on an MRI but are painless. 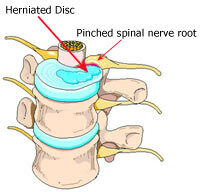 As many as 1 in 3 people have disc bulges and are completely painless. Health care professionals often call low back pain a “pain in search of a pathology.” This means that a patient’s medical tests will be negative or a test will produce a false positive. The cause could be any number of structures. So how do we treat something if we don’t know what exactly is wrong. We do know that mechanical low back pain is caused by damaged soft tissue. The damage stimulates pain nerves called nociceptors. The goal then is to promote healing of the damaged soft tissue which will eliminate the pain, not just treat the pain itself. This is done with a program that is customized to your individual needs.